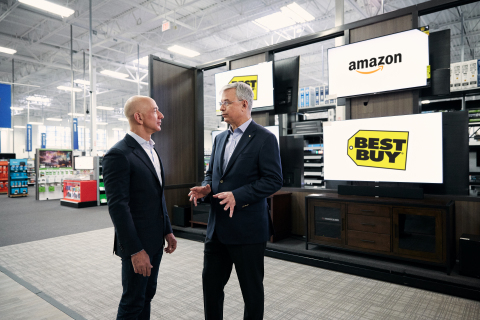 SEATTLE & MINNEAPOLIS--(BUSINESS WIRE)--Amazon (NASDAQ: AMZN) and Best Buy (NYSE: BBY) today announced a collaboration to bring the next generation of Fire TV Edition smart TVs to customers in the United States and Canada. As a first step in the partnership, Best Buy will launch more than ten 4K and HD Fire TV Edition models from Insignia and Toshiba, beginning this summer. The newly designed smart TVs come with the Fire TV experience built-in, uniquely bringing together live over-the-air TV and all your streaming content into one easy-to-view location. Connect any HD antenna and instantly use Alexa to search for and watch broadcast TV, or choose from a vast catalog of streaming TV episodes and movies from Netflix, Prime Video, HBO, PlayStation Vue, Hulu, and many more. Fire TV Edition includes a Voice Remote with Alexa, making it easy to launch apps, search for TV shows, play music, switch inputs, control smart home devices, and more. It can also be paired with any Echo device allowing you to easily use your voice to control your TV experience hands-free with Alexa. Fire TV Edition continues to improve even after your purchase, with more new Alexa skills, software features, and applications added regularly. Tens of thousands of Alexa skills are already accessible today, allowing you to have amazing entertainment experiences, view and control your smart home connected cameras, lighting, security systems, and more. The partnership with Amazon is an example of Best Buy’s unique role in working with the world's foremost technology companies, helping to commercialize their innovations and bring them to life for the consumer. The company accomplishes this through customer-focused curation of the technology it sells online and in-store; in-store demonstrations offering hands-on experiences for customers; needs-based selling expertise designed to solve problems and address lifestyle needs; and, services that support customers in installing, setting up and operating their technology. Best Buy has played this role in a number of areas, including, most recently, 4K televisions, premium computing and the smart home. Customers in the United States will have the ability to purchase the first Fire TV Edition smart TV from Toshiba beginning this summer, with additional models to be released in 2018. Fire TV Edition smart TVs will be available exclusively in Best Buy stores, on BestBuy.com, and for the first time, from Best Buy as a third-party seller on Amazon.com. The new Fire TV Edition smart TVs will be available for purchase in Canada later this year. Customers can learn more at www.bestbuy.com/FireTVEdition or www.amazon.com/FireTVEdition. We at Best Buy work hard every day to enrich the lives of consumers through technology, whether they come to us online, visit our stores or invite us into their home. We do this by solving technology problems and addressing key human needs across a range of areas, including entertainment, productivity, communication, food, security and health. Please visit us at bestbuy.com and follow @BestBuy. Amazon and Best Buy today announced a collaboration to bring the next generation of Fire TV Edition smart TVs to customers in the U.S. and Canada.